They say that you can judge a hero by the quality of his villain. Because of this, in many ways it is the villain that defines the hero. Luke had Vader. David had Goliath. The Gamers had Jack Thompson. Unfortunately, we made the classic hero mistake. We actually defeated our foe. Now, a hero can’t NOT have a villain, so we searched high and low for the next target of our hostility. Well, that man has shown his face. His name is Roger Ebert. The next boss approaches, and this guy has one heck of a health bar. For those of you who don’t know already, Ebert wrote an article stating that video games could never be art. You can read about it here, if you feel like seeing what all of the fuss is about. I’m not here to try to contradict the article, because it is his opinion regarding something that is essentially nothing BUT opinions. Sure, the title makes an absolute statement regarding a thing that is subjective at best, and he certainly presents most of his opinions as facts, but at its core the article is still just an opinion piece, and you can’t argue opinions. The more important thing is that he gave all of the rabid video game masses something to unite against. That’s something we haven’t really had since out-of-control lawyer Jack Thompson. Thompson was great, wasn’t he? He was loud, visible, and an idiot. Always tripping over himself and causing PR meltdowns. His goal was to strike down video games, upon which he blamed all of society’s ills, and to get rich doing it. The man would prey on school shootings, for crying out loud, hounding people for records regarding the gaming habits of shooters before the bodies were even cold. He was like Lex Luthor, and like all great super-villains, the best way to defeat him was to let him destroy himself. This wasn’t hard in his case. Most of his fellow lawyers were already pretty convinced he was off his rocker, and it didn’t take long for a few of the right judges to agree. Roger Ebert is something else entirely. He’s respected, eloquent. He doesn’t even pose a direct threat. It is not his goal to destroy video games. Maybe, since he doesn’t know enough about modern games to speak intelligently regarding them, he just wants to make sure that they never start horning in on his action. So he uses his gravitas to attempt to bar them from his arena. Whereas Jack Thompson was the purple tights wearing mad scientist version of Luthor, Ebert is the suave and respectable businessman version. Unfortunately, this means he probably isn’t going to self destruct. He’ll just sit there in front of his keyboard, periodically typing out a long-winded salvo that boils down to “games aren’t art because I get to decide what art is,” and assuming he’ll never have expand his critical horizons. Probably he thinks that the frenzied horde he stirred up will eventually wear itself out. This shows a fundamental misunderstanding of the gaming community. Gamers are a group who will argue the smallest point to the bitter end. Is Link’s foe Gannon, or Ganon? Seems like an insignificant issue, but you better believe that the thread will be 200 pages long by the end of the week. I’d wager that half of the gamers out there couldn’t care less if games were considered art, but show them the Ebert article and they will mount a campaign to have Q-Bert on display in the Louvre. Arguing with the average gamer is like arguing with the devil. We don’t rely upon things like logic and facts, which from the looks of his article suits Ebert just fine. Like him, we argue with unfounded opinions and raw volume. 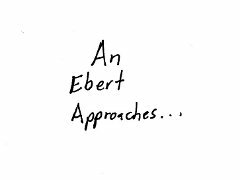 Ebert’s volume comes with the weight carried by his well respected words. His writing is read by many important people. We get our volume from sheer quantity, actual shouting, and endless ferocity. Gamers are like crotchety old men with the stamina of an over-caffeinated preschooler. We are legion, and we wield the internet like a battle ax. Then, when our opponent is sick of fighting, one of the smart gamers steps forward and delivers the rhetorical killing blow with an argument pithy, succinct, and brilliant. Ebert is a worthy opponent, a bastion of the old looking to clash with the scrappy newcomers. This is going to be a fun fight, folks. I hope it lasts.